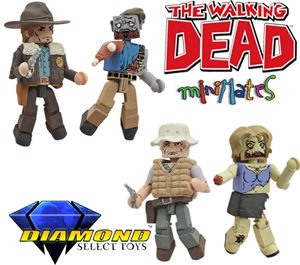 Review: This time around we have two different playsets from The Walking Dead line of MiniMates. I want to first off start by saying that this line of MiniMates are awesome. For those who are fans of the television series you will dig these collectibles. Like the previous set that I reviewed of the Frankenstein set these are very well made. Now I really did like that set, but I see this one more as a set that you can play with more and the Frankenstein set is more of one for decoration or show. Let the autopsy begin! Look and Detail: Now for these figures I will say that they do look damn close to what the characters look like in the comic books. Like with other MiniMates the amount of detail put into these small figures is great, the practically have everything that the character had in the show down to the right colored clothes. I really like the gore and morbid details that they put on the zombies. They have ripped off jaws, exposed guts, chunks of flesh missing, and torn in half arms. The gore hound in me loves the love and care they put into the gore. Articulation: The articulation on these figures is excellent. Practically every single part of these figures are moveable which allows for plenty of possibilities to pose these figures.There are so many points of articulation from head to feet on them. Each figure has 14 points of articulation and that just makes them much more desirable and fun to play with. The arms, head, and waist are able to rotate 360 degrees, the legs can't do that but they do have plenty of movement nonetheless. Accessories: There is a decent about of accessories with these two sets. 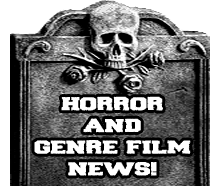 The set of Rick Grimes and One Armed Zombie have a pistol, shotgun, rifle, hatchet, backpack, interchangeable arms, coat, and hair for Rick, and interchangeable arm for the Zombie. The Dale and Female Zombie play set comes with a pistol and an interchangeable arm for the zombie. Now even though the Dale set does not come with many weapons (which makes sense if you watch the series) you can use the other weapons from other sets with it. With there being alot of different Walking Dead sets it would make for a fun time the more you get. Overall these do come with some very cool accessories. Rundown: These are some very cool action figures that fans of the series will enjoy. I think those who want to just collect will dig them as well as those who wanna have some fun and make a cool stop motion film with them will have fun with them as well. MiniMates are some of the cooler miniature figures I have ever seen or had the chance to play with. The age limit is recommended for 8 years and up which I do agree with due to so many small parts that can come off, but if you supervise your child the whole time while playing I personally would say 5 years and up would be fine. I had a fun time playing with my 5 year old. It's a great series of toys for families who love zombies!